Colorful and successful. 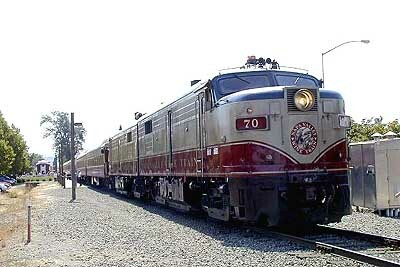 On the left San Joaquin train #712 at Stockton, California, on its way from Oakland to Bakersfield in April, 2002. My trip was about as enjoyable as rail travel gets. Friendly staff, spit and polish timekeeping, good views, and some really nice food in the sit-down section of the food service car. Kudos to Amtrak and California -- may the co-investment model spread! 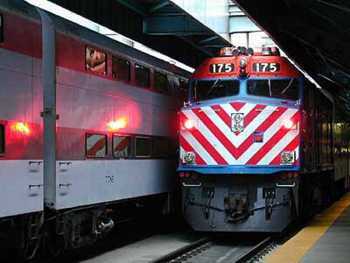 On the right a Metra scene in Chicago's Olgivie Transportation Center in the Summer of 2000. 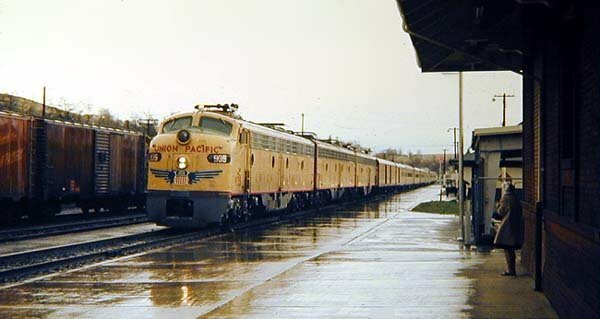 It's 1968 and the UP's City of Portland, my favorite train, is arriving at, if my notes serve me correctly, Pendleton, Oregon, on its way from Portland to Laramie, Cheyenne, Omaha, and Chicago. It'll have lost its dome diner, which disappeared when it no longer combined with the City of Denver in and out of the Mile High City, but its normal consist was still impressive, with dome lounge, dome coach, diner and a full complement of sleepers and coaches. On a miserable day it was doubtless a calm and stolid place to be a guest. Just think, legroom, great food, and on time service, none of which today's Union Pacific wants anything to do with -- and the average traveler can get nowhere else but on a train. Though there is occasional talk of Amtrak reviving this route, its reappearance will have to await the settlement of many of the long-distance issues first -- political imperatives for restoration, and the political costs associated with killing the Pioneer notwithstanding. August 31, 2002, west of London, England. A spanking new Virgin Trains Voyager cross-country express on the line from Oxford skims by the Didcot Railway Centre and one of its venerable old locomotives. 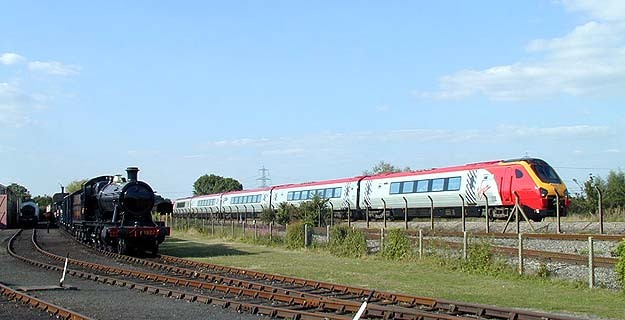 One of three new classes of trains purchased by Richard Branson (the others are tilting Super Voyagers and the heavier and lengthier electric-powered Pendolinos for the West Coast Main Line), the Voyager class trains are capable of 125 mph (the Pendolinos 140 mph). Each Voyager consists of a Club Class car, and four coaches (one with a tiny food service bar), with engines purring beneath each rather than at the head ends. I rode several Voyagers and Super Voyagers (capable of more coaches and with nameplates of famous UK explorers) on my trip. In some respects they resemble Amtrak's Acela in design (they were built by the same company), and they are lighter in weight. Like their American cousins, there are many bugs to be worked out -- computer systems that lock on air conditioning and heat at the same time, toilets that close down if not flushed.... But all in all they were a pleasure to ride and Virgin provides very friendly and good on-board and station services. Whether these fleets of new trains will dampen the continued public dissatisfaction with the privatized rail system in the UK is hard to say, but there has been an explosion in trains and passengers and by and large I found far fewer delays and poorly maintained equipment on this trip than on the ones I took in 2001. It's early September, 2001, in Northern California, where there has been nothing short of a rail renaissance. 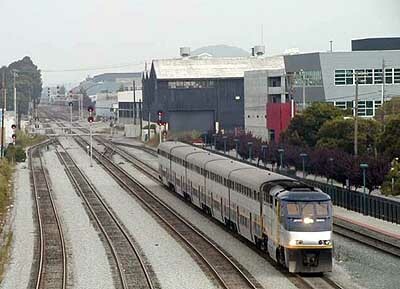 On the left is an Amtrak-California train arriving in Emeryville from Sacramento. 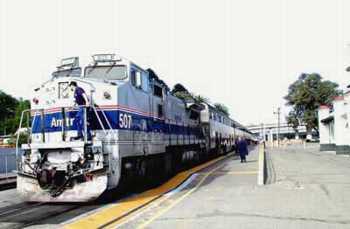 On the right is the Napa Valley Wine Train, photographed in Napa. Not only is it one of America's most beautiful trains, but Amtrak connecting buses from Emeryville and Martinez, where the Amtrak train will stop, make it easy to enjoy. Now that's what I call intermodal! Changes last made on: October 23, 2002.